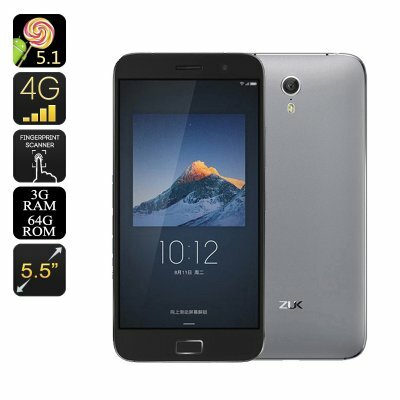 Successfully Added Lenovo Zuk Z1 Android Smartphone - 5.5 Inch Display, Quad Core CPU, 3GB RAM, Fingerprint Scanner, 4G, 64GB Storage (Black) to your Shopping Cart. The Z1 comes from Lenovo subsidiary brand ZUK and is an attractively priced Android phone that looks remarkably like the iPhone 6S. So if you're a fan of Apple's design but prefer an Android OS it is the phone for you. With a 5.5 inch full HD display puts it in the phablet category and offer great viewing at more than 400 pixels per inch. With a fingerprint sensor below the display you can easily unlock the phone without the need for pass-code or screen patterns bring added security and speedier access. With the phones LiveDisplay mode the screen brightens will and colors will be adjusted to offer the best viewing experience in any light. so at night the offer a warmer friendly view, while in full daylight the brightness is pumped up so as you can still clearly see the display. With hardware that's able to compete with high end flagships the Zuk Z1 has been well kitted out when it comes to hardware. A Snapdragon 801 Quad core CPU clocked at 2.5GHz and 3GB of RAM, so there is no problems running games on this device. A generous 64GB of internal memory offers plenty of storage and for usage times the 4100mAh battery will bring enough power to keep you going all day. Dual band (2.4GHZ and 5.8GHz) Wi-Fi connectivity means much faster data speeds and when there is no wireless network around you can always switch over to the 4G support, with support from frequencies covering the majority of Europe, Asia and the Middle East you can get the fastest cellular connections wherever you are. A Type C USB port is located on the base of the phone and makes for quick easy data transfers. This future proof port also brings great charging times and ensures the future proof phone will be compliant with all the future tech to come. The Zuk Z1 Android smartphone comes with a 12 months warranty, brought to you by the leader in electronic devices as well as wholesale Android Phones..